This is one heavy heart that is considered a GOOD thing! 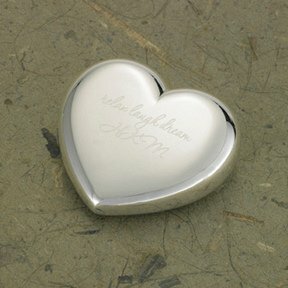 Your true love will think of you fondly each time he/she sees this beautiful paperweight on his/her desk! Ideal for home or office, this personalized silver-plated paperweight is made of durable brass and measures 2" x 2" and its thickness is 3/4". Add a special, personal message of up to 2 lines (20 characters per line) which is included in the price.